You'd think it would be the worst athletic feeling in the world: fourth place at the Olympics, just missing a medal. But Air Force Capt. Seth Kelsey doesn't seem to mind. 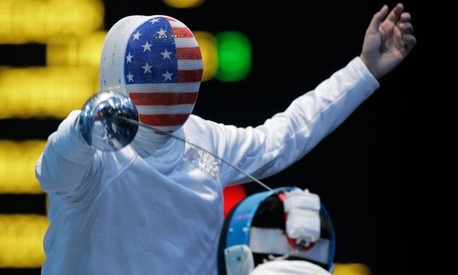 Which actually is not that shocking, since his fourth-place finish in epee fencing at the Olympics was the best performance by an American in the event since 1956. "I was very excited about my results, that I was able to beat the No. 1 ranked guy in the world and win two other bouts," Kelsey told Air Force News Service. "I would have loved to have gotten a medal, but I came super close and lost in overtime. I was happy with how I performed and how I represented my family, my country and my unit. So, at the end of the day, I was disappointed that I didn't get a medal, but I was proud of what I did and how I achieved it." In the bronze-medal match, Kelsey lost by a single touch in overtime. When he returns to the United States after the Olympics, Kelsey plans to take a break from fencing, but he'll stay busy. He'll be on duty and in training with his squadron at Buckley Air Force Base, Colo.
Next Post | Do You Want to Be Told What To Do?